In 1975 in Orton, Ontario, Lindy Tucker and her neighbors began experiencing events of such high strangeness that Tucker's subsequent investigations led to founding a research organization and having some of her work published in the MUFON Journal. Tucker launched Phenomena Under Reasonable Evidence (PURE) Research and her article, Tracing Sound to UFO Encounters , was published in the October 1994 Journal. The article presented an excellent summary of Tucker's research into beeping sounds associated with UFOs. While the UFO sightings and accompanying beeps that were experienced in the Orton community were plenty strange in and of themselves, there were further events worthy of consideration in the context of the crop circle phenomenon. In an article titled Second Sight , Tucker further explained the strange goings ons in southern Ontario during the spring and summer of '75. 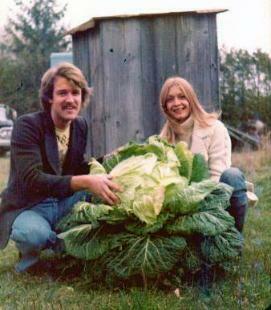 Then her garden produced a whopping 75-pound cabbage. Tucker with the amazing cabbage. I suppose it largely depends on the reader as to what they suppose Tucker's experiences and research indicate. Proponents of the ETH will no doubt see evidence of aliens in between the lines, while those who prefer to believe all crop formations are hoaxes, regardless of what they think about UFOs, might prefer to think the downed corn near Tucker's home had little or nothing to do with her other strange experiences. Yet another perspective might be held by people who notice the likely presence of concentrated amounts of electromagnetic frequencies (EMFs) and microwave pulses as suggested by Tucker's descriptions of electronic anomalies, malfunctioning compasses, singed crops and unexplained burns. Such are indeed the things that research projects of the era and overexposure to EMFs are known to be made of. I cannot say with any certainty if humankind is the only intelligence using microwave and electronic frequencies, if there are visiting aliens that also use such forces, if some kind of natural yet intense EMFs were manifesting in Orton or, for that matter, if intense EMFs were present at all. Combinations thereof are also possible and I by no means claim to conclusively know exactly what has taken place around Lindy Tucker. As promised in the first post of this series, I will simply present facts and encourage readers to form their own opinions about what the facts indicate. While I do not know the extent intense microwave forces may have been present in Orton during the UFO flap and strange occurrences of 1975, I do happen to know that artifacts of intense microwave energies have been identified in not only select crop formations, but also quite likely in the homes of select alleged alien abductees. There are indeed curious circumstances that justify further research, whatever one may suspect such circumstances ultimately indicate. The work of William C. “Lefty” Levengood (pictured left) includes examinations of crop circles and cattle mutilations, as well as investigations of alleged alien abduction. Levengood, a Michigan biophysicist and consultant to ICCRA who has personally examined plants from over 300 crop formations, was credited with identifying glassy particles curiously located in the homes of select alleged abductees . Interestingly, such particles were not found in a sample of homes of non-abductees. We can only speculate on exactly what caused such apparent trace evidence, but I find it noteworthy that, according to Levengood and other researchers, similar glassy particles have been located in select crop circles. While intense microwave pulses might be among the possible factors on a list of potential, even if just partial, explanations, we need not entirely speculate when it comes to identifying circumstances that virtually certainly establish a connection between an alleged abductee and extremely unusual EMFs. An extraordinary tale  was making the rounds in which Levengood had quite cleverly instructed an abductee as to how they might possibly obtain evidence that something was indeed regularly taking place, whatever that something might eventually turn out to be. As the story went, Levengood supplied the female abductee with an assortment of hair curlers, each having a plastic capsule stuffed in it which had seeds, allegedly wheat seeds, placed in it. Each night, before going to sleep, she was to put a hair curler in her hair. Each morning, she was to properly date and store the curler, documenting in a journal if she had experienced anything unusual during the previous night or 24 hours. According to various Internet sources, the woman experienced some type of high strangeness, or possible alien abduction, one night during the experimentation period. Levengood would later find the seeds to indeed be altered which coincided with the date of the strange experience. As the story went, the seeds were completely fried. I contacted William “Lefty” Levengood in 2010 so I could find out more about such extraordinary claims. Levengood graciously agreed to participate in two telephone interviews conducted during July of 2010. As is often the situation with tales circulating around the Internet, Levengood informed me there is truth mixed with inaccuracy in the hair curler story. However, in this case, I found the truth even more interesting! From the outset of our discussions, Levengood stressed he was committed to accuracy. He clearly wanted assurance his statements would be presented properly and not taken out of context. He wanted it clarified he discourages unfounded speculation and had made no conclusive connections between phenomena such as reported crop circles, alien abductions and cattle mutilations. Actually, he went as far as to discourage the discussion of such phenomena in the same context, as connections are not yet conclusively established. An example of his commitment to accuracy can be observed in his preference of the term bovine mutilations to cattle mutilations. Levengood is quick to warn there is a vast spectrum of microwave frequencies, and that assumptions should therefore not be made about microwave artifacts necessarily originating from the same source. He also pointed out it would take a great deal more work to quantify accurate details surrounding the glassy particles. I found this subject matter very interesting in the context of electrical anomalies, as are commonly reported during and following certain events of high strangeness. I asked about microwaves and their apparent relationships with crop circles. “The microwave that's applied in crop formations – that is of the very, very efficient wave length,” Levengood said, pointing out that electrical devices and batteries are subject to malfunction within certain crop formations. He further explained how early on he conducted some experiments. Michigan farmers were helpful in supplying Levengood with fresh samples of wheat, and he would take it home and “stick it in the microwave.” While he was able to duplicate plant abnormalities as found in authentic crop formations to a certain extent, the process took too long and was therefore not an entirely accurate simulation, he said. I asked about the hair curler incident. The story did actually happen, as Levengood thought it would be a good idea to use seeds to try to document the presence of abnormal energies surrounding the female abductee. “I could give you a whole day's lecture on work just with her,” he proclaimed. The first inaccuracy in the story was the type of seeds. The actual seeds used were Arabidopsis thaliana, a small flowering plant in the mustard family commonly used by the international research community. He said the woman followed instructions very well, doing an excellent job of documenting details of her activities. Every seven days Levengood would retrieve the hair curlers from the previous week while supplying her with seven more, each packed with a plastic capsule containing seeds. He would then dig the plastic capsule out of each returned curler, review the related written information, and, interestingly enough, plant the seeds. He eventually came across the journal entry indicating an experience of high strangeness and the corresponding plastic capsule. “It was heated, of course,” he said. I confidently suspect Levengood's assertion the capsule had been heated is why the inaccurate detail circulated that the seeds were fried, a detail that was simply incorrect. According to Levengood, the seeds were not wasted. Quite the contrary. Levengood stated the seeds in question grew with “increased vigor,” significantly outgrowing the other seeds! Upon discovering this to be the case, I was immediately reminded of Tucker and her 75-pound cabbage. I was therefore eager to hear more about circumstances of which Levengood was aware in which growth rates of plants were obviously altered by whatever was taking place around them. Quite interestingly, one such circumstance included what Levengood called the “most unusual crop formation” he ever saw. Further investigation revealed related circumstances have indeed been of interest to researchers - and for quite some time. Stimulation of plant growth has been explored for decades by means of exposing seeds or plants to low doses of ionizing radiation or by the use of radioactive fertilizers. A lack of credible statistics on the history of crop circles tends to muddy the waters of clarity. We find this to particularly be the case when trying to limit our review of the situation to formations defined as authentic crop circles, plants downed and consisting of measurable plant abnormalities resulting from unexpected energy. Early reports that could be perceived as related to crop circles date all the way back to 17th century England . Although popularly discussed among crop circle enthusiasts, such events are not well documented, are largely subject to interpretation and ultimately provide us with little verifiable evidence. While there are many rumors about crop circles, it is generally accepted that England is home to the majority of reported formations, authentically interesting or not. The Independent Crop Circle Researchers' Association states formations began being reported in the U.S. during the 1940's . Reports were slim to none for several years thereafter, increasing in numbers and frequency during the mid 20th century. Reports took off in the States in 1990 when 25 crop circles were reported, a record high surpassed by 35 reports in 1997. The U.S. record was again broken in 2004 when 40 crop circles were reported. Canada is no stranger to such reports, and formations are subject to popping up, or down, depending on how we look at it, intermittently around the globe, as was recently the case in Indonesia . For whatever combinations of reasons, reports of crop circles took hold and increased. Furthermore, Ms. Talbott and her research team documented both geometrically and non-geometrically downed plants occurring in the same fields, apparently relatively simultaneously. Patches of seemingly randomly downed crops were documented to overlap geometric crop circle formations. If all of that is not intriguing enough, it gets even more interesting: evidence indicates the energy systems that apparently create the formations revisit the fields. The creation of an authentic crop circle is not necessarily a one-time occurrence limited to a single evening as commonly believed. Flying objects, both unidentified and identified, became enmeshed with the crop circle phenomenon as it received increased attention. Lights, orbs and ominous black helicopters were reported zipping about in the vicinity of crop circles and those who investigate them. Some of the most publicized accounts of such circumstances involved leading crop circle researcher Colin Andrews . Members of the crop circle research community additionally report harassment by people assumed to be involved with military agencies. Such accusations resulted in escalating tension and distrust among researchers toward government figures and agencies, byproducts of which include the publication of Government Circles , a book authored by Mr. Andrews. What are the possible explanations for such strange circumstances as addressed thus far? To begin composing a list, we should review the work of a few more independent researchers, including Lindy Tucker and William C. Levengood. We will begin considering their work in my next post. Most everyone even remotely familiar with the UFO phenomenon has marveled at crop circles, intriguing formations that are sometimes both complex and stunning. Crop circles long since became conceptually joined with UFOs, for better or for worse, at least in the court of popular opinion. Should they be joined? Is there, in fact, reasonable evidence to conclude that unidentified aerial phenomena are related to crop circles? Are these curious formations the preferred method of communication of a civilization so alien to our own that we struggle to comprehend even their most basic means of reasoning, or do the origins of crop circles lie somewhere in explanations that are much less sensational, interesting as those explanations may be? In a series of upcoming posts I will explore such questions, presenting information for consideration while encouraging readers to form their own opinions. The information to be presented was obtained through interacting with select researchers over the years, reviewing their work and presenting them with specific questions. Such was the case when William C. Levengood, a retired Michigan biophysicist who remains quite active in ufology, agreed to participate in telephone interviews conducted during July of 2010. Mr. Levengood first became interested in crop circles over 20 years ago, leading to personally examining select formations and their altered plant structures. He has now analyzed over 300 formations in his lab. Further information about Mr. Levengood, his work and how it correlates with the work of other researchers will be presented. We should begin by defining a crop circle. The term actually earned a spot in the Merriam-Webster Dictionary, largely due to the work of Colin Andrews, an electrical engineer from the United Kingdom who is considered a leading authority on the subject . Merriam-Webster defines a crop circle as a geometric and especially a circular pattern of flattened stalks in a field of grain now usually attributed to natural phenomena or to the work of hoaxers trying to create the impression of a visit by extraterrestrial beings . While the Merriam-Webster definition might be reasonably accurate for a certain percentage of crop circles, maybe even a large percentage, select researchers might very well label the definition incomplete. Organizations such as the Independent Crop Circles Researchers' Association (ICCRA), of which Mr. Levengood is a consultant and independent ufologist Lindy Tucker, who aspects of her work will be considered, is a member , are a bit more particular in defining authentic crop circles. Authentic crop circles should contain anomalous circumstances such as artifacts of intense energy, probably microwave. Plant nodes are elongated and plants are altered at a cellular level, sometimes rather dramatically . Such circumstances must be identified to separate authentic crop circles from what have become increasingly elaborate and competent hoaxes. Skillfully created hoaxes aside, what of the crop circles that contain anomalies qualifying them as authentic? What has truly been established about such formations? What are the longer term effects? Who or what might be creating authentic crop circles, and how and why? We shall indeed explore the trails where such questions lead us, following on the heels of crop circle research pioneers William C. Levengood, Colin Andrews, Lindy Tucker, Nancy Talbott and Dr. Jacques Vallee, who contributed to forging the trails. We shall explore what Mr. Levengood, among others, learned about correlations between select crop circles, accelerated plant growth and how it correlates with certain other crop circles. As we shall see, select crop circles share very curious trace evidence with select reports of alleged alien abduction. I will present facts. I encourage you to decide for yourself what you suspect the facts indicate.